Calls for a second independence referendum would be “against the majority wishes”, the Scottish Conservative leader has said. 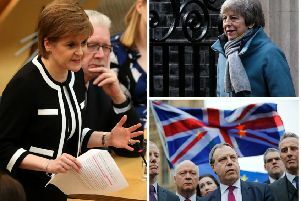 Ruth Davidson told BBC One’s Andrew Marr Show that Nicola Sturgeon was “hell bent” on destroying the United Kingdom and described Brexit as “this week’s excuse” for another independence referendum. Ms Davidson said: “The SNP is not Scotland and they are acting against the majority wishes of the people of Scotland in putting forward their proposition on Monday. “I’ve read far too many headlines saying, ‘Scotland reacts X, Scotland reacts Y’. No, it doesn’t. She said it was “astonishing” that the SNP had not outlined a plan for independence during their spring conference in Aberdeen over the weekend.